Sneaky, the library cat, appears in the Cobble Cove mystery cozy series written by his author, Debbie De Louise. He was first introduced in A STONE’S THROW and has some starring roles in BETWEEN A ROCK AND A HARD PLACE that was released in October, 2017. In April, Written in Stone, the third book of the series was released. 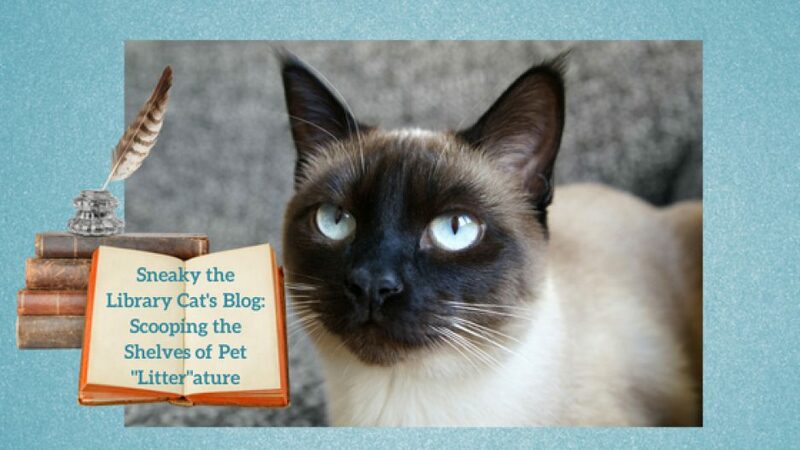 Sneaky will post Mew Review Spotlights of the latest in cat litter-ature on a monthly basis. If your book is soon-to-be released, please send the info to his author at: debbiewriter@yahoo.com with the date of the release, a brief blurb, and cover image at least by the 15th of the month before release. If the book is part of a series, please indicate the number it is in the series and the series name. Also indicate the genre. All fiction with cats in major roles are welcome. Non-fiction, cat-related books are also welcome on a space-available basis.